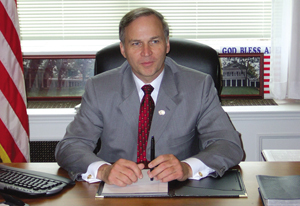 Rep. J. Randy Forbes (R-Va.) represents Virginia's 4th congressional district, which stretches from the southeastern corner of the state to southwest of Richmond. Home to several military facilities and next door to the Naval Station Norfolk, the district has dozens of Department of Defense contractors. This month, Forbes formed the Congressional Modeling and Simulation Training Caucus to showcase and promote the industry. Several contractors, including Anteon International Corp., Lockheed Martin Corp. and Northrop Grumman Corp., joined Forbes on Capitol Hill to demonstrate some of the latest modeling and simulation technology. Forbes, a member of the House Armed Services, Science and Judiciary committees, spoke with Staff Writer Doug Beizer about the importance of this technology. WT: Why did you establish this modeling and simulation caucus? Forbes: It is an industry where the average salaries range from $59,000 to about $65,000. There are few industries that match that. It has some of the most creative people in the country. And for me, as a member of the Armed Services committee, my No. 1 goal is protecting the United States of America. This industry is vital if we are going to be successful in doing that. WT: How does this relate to issues before the Science committee? Forbes: I've always said we had two great weaknesses in the United States. One was terrorism and the vulnerability there, but the second was a lack of math and science students. This industry is just a magnet drawing people to math and science. WT: How challenging will it be to win federal dollars for modeling and simulation programs? Forbes: First of all, this is the biggest money saver we have going. The second thing is that it's not just money that we're saving ? it's time and lives. By being able to do this kind of training, this kind of modeling, it keeps us from making mistakes that cost us servicemen and women, and that's something we are not going to spare money doing. The other thing people do not realize is the rest of the world is involved in this industry, too, including China. When you go over there and talk to them, they are heavy into modeling and simulation. The projects they're working on are just astounding. One of things we're concerned about is not just the training we're doing today but what this could lead to: additional weapons and things like that. If we're not at the cutting edge on that, we could lose out in national defense and economic vitality five, 10 years down the road. WT: What about commercial applications? Forbes: We are just a step away from having this industry explode in areas such as medicine, manufacturing and environmental research. Three years from now, we could see Microsoft putting this kind of technology on desktops. The civilian applications are going to create a synergy that is vitally important, because it heightens the entire industry. What we have to do is take the brilliance and vision of the people in this industry, and be able to put that in a package that we can articulate to the average person who still doesn't understand what this industry does and what the opportunities are. Also, we have to make sure Congress understands, and that's one of the roles of this caucus. We need to get the two of those efforts lined up. WT: What are your thoughts on funding NASA? Forbes: We're making huge mistakes in some of the cutbacks we're doing on research, especially aeronautical research. There are few programs better than NASA at drawing math and science students along. If we don't do something to increase the number of math and science students in this country, we will have huge problems. You can't continue to import math and science students and be as successful as we want to be as a nation. If you look at [the U.S.] share in the aeronautical industry, we've dropped from about 70 percent market share to 50 percent. A big part of that is because of research. The Europeans understand the need to support aeronautical research. We shoot ourselves in the foot by not spending more money in aeronautical research. I really think we as a Congress have to step back and say, "Do we want to be involved in aeronautical research and, if so, are we doing enough?" I don't think we are.